Not too long ago I silently observed a debate among friends regarding modesty. One had posted an article by a popular Christian speaker telling the ladies to cover up lest we cause our brothers to stumble. The other side of the debate commented on the responsibility of our brothers to control themselves and respect women. Multiple voices engaged in the debate and I believe they all had a point. When it comes down to it I really believe it is about the heart of the matter. What is God’s glory? I recently heard author/pastor John Ortberg say we are glorifying God the most when we live out who He created us to be. While this is not only about what we do with our life there is action and intent involved. Perhaps when I am hot and choose to wear a more revealing top I am not helping my brothers. However, my intent here would be about staying cool and not seducing the boys! I am sure men walking around shirtless would often say the same thing. That does not mean a bare chested man does not cause one of his sisters to stumble. My question to those seeking to glorify God is how does your everyday life bring God glory? 1 Corinthians 10:31 says, “So whether you eat or drink or whatever you do, do it all for the glory of God.” (NIV). I do not think there are black and white rules about how we should dress. And by no means does a man or women’s apparel give anyone the right to violate them. I think this issue is more about your heart. The reality is the standard will be different for everyone, whether you are a Christian or not. I don’t believe anyone out there can tell me what modesty looks like. Just move to the Middle East and I guarantee we would either feel like we were flaunting ourselves about or possibly we would feel sad for the lack of freedom some women in the world possess. 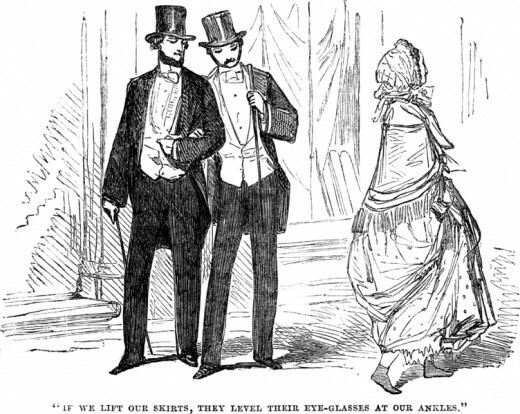 Read a book from the 1800’s as scandalous women show off their ankles to nearby men. Today’s scandal’s involve wardrobe malfunctions and scantily clad men and women barely covering the essentials. I wonder if the women in the Middle East ever feel sad for us? Look to your own heart and to God about what you should eat, drink, and wear. Resist judging others (Mt. 7:1) and lean into the areas of life Jesus is calling you to refine. If it is lust ask for the Spirit’s help and resist blaming others. If you struggle with a need to get attention and approval through your body, than lean into Jesus. Instead of using you, Jesus will show you a love without condition. Yes there are ways we can lift each other up through the way we live our lives, which can include how we dress. Some of us may feel called to address this area and others may not. We are all being transformed daily and He is faithful to complete the work He has started. Let’s show each other grace and pray for the transformation of each other’s hearts!